Essential oils are a godsend to many people. They make them feel better when they have a stuffy nose or are having a hard time sleeping. They can make a room smell better and lighten the mood. One of the best ways that you can incorporate essentials oils into your life is with an essential oil humidifier. This is an especially great thing to have on hand during the winter months with the dry air from having to run the furnace all the time, not getting enough fresh air in the home, along with all of the winter bugs that seem to go through homes, offices, and classrooms like wildfire. You’ll be able to get all the benefits of a humidifier and your favorite essential oils for all of your ills. 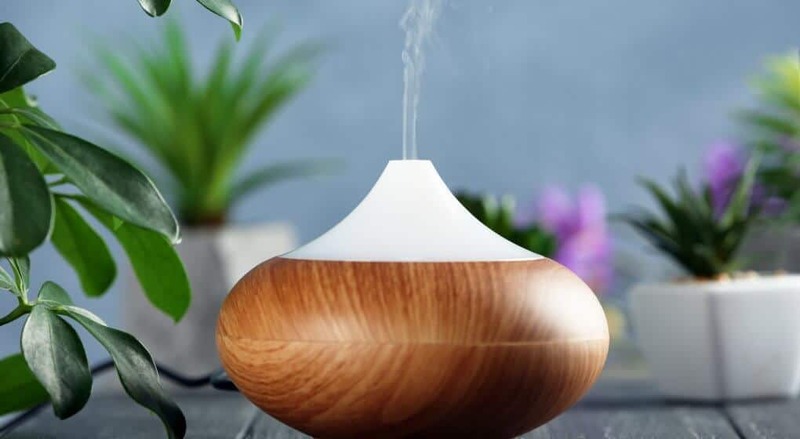 If you are looking for an option of using your favorite essential oils and moisturizing the air at the same time, you will need an essential oil diffuser that also acts as a humidifier. Humidifiers are used to help relieve the adverse effects of dry air. The relative humidity of the air plays a role in determining your comfort level. A humidifier adds moisture to the air in different ways. A steam humidifier boils water and releases warm air into the room. An evaporative humidifier has a reservoir holding cold water and it is dispensed into a basin. Air is pulled into the unit by an internal fan and it passes across a wick filter that absorbs water from the basin. As the air passes through the filter, water is evaporated. An ultrasonic humidifier uses a diaphragm that vibrates at an ultrasonic frequency, creating droplets of water. Humidifier uses are diverse, ranging from creating more comfort to helping improve health. In winter, dry air and closed windows can affect your respiratory system and make you more susceptible to infections. Low humidity can make the air feel even colder. When the air is too dry, your sinuses don’t drain properly. When air is moist, the nasal passages are more lubricated and this helps with sinusitis and congestion as well as allergies, colds, and asthma. The moisture from a humidifier can also help to reduce snoring by keeping the throat moist and also helps you to avoid dry skin and chapped lips. It can even save some wear and tear on your home as dry air also dries out wood used in its construction. Can I Use Essential Oils in my Regular Humidifier? Many people confuse essential oil diffusers and humidifiers. The difference is that humidifiers regulate the amount of moisture in the air and diffusers disperse essential oils into the air. Both are beneficial but most humidifiers are not built to hold essential oils and they may damage the device or distribute the wrong amount of essential oil into the air. On the other hand, a number of diffusers also act as humidifiers. They do not distribute the same amount of water into the air as a humidifier alone but they definitely contribute to the moisture content of the air. If you want to have the benefit of essential oils and moistened air at the same time, an essential oil diffuser humidifier is a good option. There are several factors that you’ll want to keep in mind for choosing your essential oil humidifier. The first is just to size the device appropriately to the space where you intend to use it. More isn't always better. A small device is great for a cubicle because your whole office may not agree with the scent you choose to diffuse today. Conversely, that same device won't cut it for a large living room. These devices all use the same technology and and similar features but there are a few small differences. The other large difference is just the appearance of the diffuser. As you can see from the images below, these can be made to look elegant like a vase or very much like a box. What looks good to you and how much you value the LED lights is the other big decision factor. The URPOWER Diffuser Humidifier acts as a diffuser and cool mist humidifier. Add 100ml of water and a few drops of your favorite essential oil and it quietly releases its fragrant, soothing mist for up to 6 hours. It offers all the features of a great diffuser - the mist mode is adjustable and it has LED lights in seven different colors. It also acts as a humidifier because it releases a cool mist that helps to moisturize the air in small spaces such as a small bedroom or a workspace cubicle. The VicTsing Essential Oil Diffuser Cool Mist Humidifier with its classic wood grain finish, covers up to 25-30 square meters. It has four time setting modes – one hour, three hours, six hours and continuous. The 300ml tank gives a mist time of up to 10 hours and you can select a weak or strong spray. The 7 LED lights can be cycled or set on one color and each color has a dim or brighter setting. It offers auto shut-off and the unit has a one-year warranty. This is a great diffuser but it also acts as a cool mist humidifier. The Square Aromatherapy Essential Oil Diffuser Humidifier by TomCare is beautifully modern with its classic cube and natural wood grain design. It has a 700ml capacity and can run for 10 hours on a high mist setting and 20 hours in low mist mode. It can be set to run for one hour, 3 hours, 6 hours and continuously. The 7 color LED lights can be rotated, set on dim or bright and turned off completely. It has auto shutoff and is very quiet. This essential oil humidifier not only disperses essential oils but humidifies the air with its cool mist. Be sure that you read the instructions for the diffuser that you pick as this will help you to keep it clean and make it last longer. Sitting water in your tank can lead to health problems as mold and mildew can grow in a humidifier that isn’t properly cared for when not in use. You may think a quick rinse will allow you to clean it completely, and let you use it again, but this could cause you to spread spores into your home environment. You’ll also want to keep an eye on your diffuser when you start using it, especially if you have it located near wood floors or furniture. Some humidifiers can make a bit of a mess depending on how you use it with the water vapor. It can be a good idea to keep a towel on hand to wipe up any mess or keep it underneath it for any spills. In addition, since you’ll have this running to an outlet, you’ll want to make sure that none of the water makes its way to your outlet as this could pose a huge electrical risk for your home. As mentioned before, humidifiers do not usually have the option of dispersing essential oils. Most of them are designed to handle water but not essential oils. A humidifier does not break up the essential oils into fine particles like an essential oil diffuser. Using essential oils in a humidifier is not a good idea because they can destroy the unit. Some people use cheap humidifiers and add essential oils because they don’t mind replacing the humidifier. However, most humidifiers are expensive and they are not made for the purpose of dispersing essential oils. Using them in a warm air humidifier makes no sense as this not only destroys the humidifier but affects the quality of the essential oils too. Now you know how to get all of the benefits of the best essential oils with the benefits of running a humidifier in your home without having to run out and purchase a new humidifier every so often from the essential oils ruining it. This investment will go a long way towards making you feel better in all aspects of your life. You can run this at night to help you sleep with a nice soothing lavender essential oil blend. You can run it during the day to help energize you with a nice citrus essential oil blend. It’s all about you. Be a healthier and happier you when you start incorporating this into your life. Have you ever tried using essential oils in your regular humidifier how successful was it for you? Do you have a special diffuser that acts as a humidifier in your home? Let us know all about it so others can learn from your successes and failures. Be sure to share this article with all of your friends that you think would benefit from having a little more essential oil in their life.